I know it's only Thursday. I know we technically have a whole new day to get through before we can collapse in good conscience. But in the last four days, I've battled a fever and a cold and a smattering of seriously evil hormonal swings, so I've decided that this week is done. Done and over with. Move along, week. We've had enough of you here. Wake us up when it's next week and we can go back to speaking, walking, and living like normal people again. 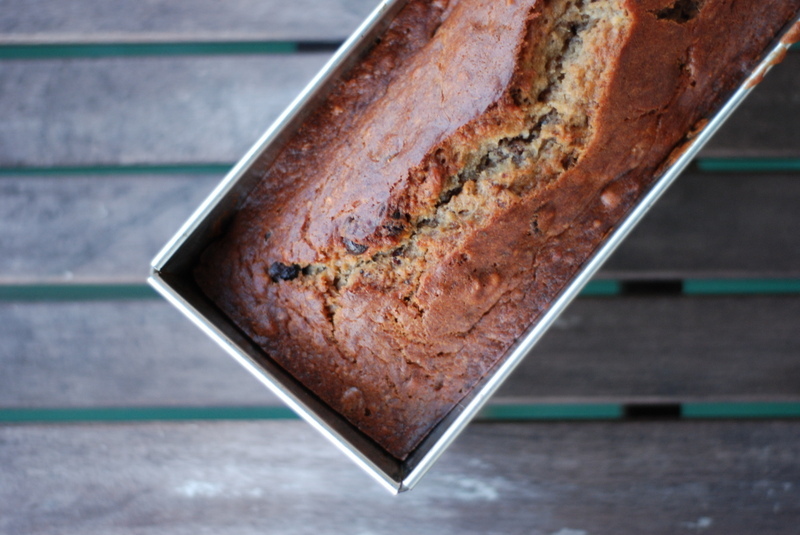 I happen to like baking my banana cake in a loaf pan, and if it's baked in a loaf pan, then I happen to like calling it banana bread instead of cake. You know? The butter versus oil debate is secondary to the pan debate and while it's true that all of this is semantics, yes, it's about the only thing my fever-addled brain can handle at this moment. In fact, I don't even really seem to be capable of stringing coherent sentences together anymore, at least not without going cross-eyed and yelping feebly at the computer screen, so with that I leave you, folks. I'm going to bed and if my prayers are answered, I'll be waking up in about 72 hours. 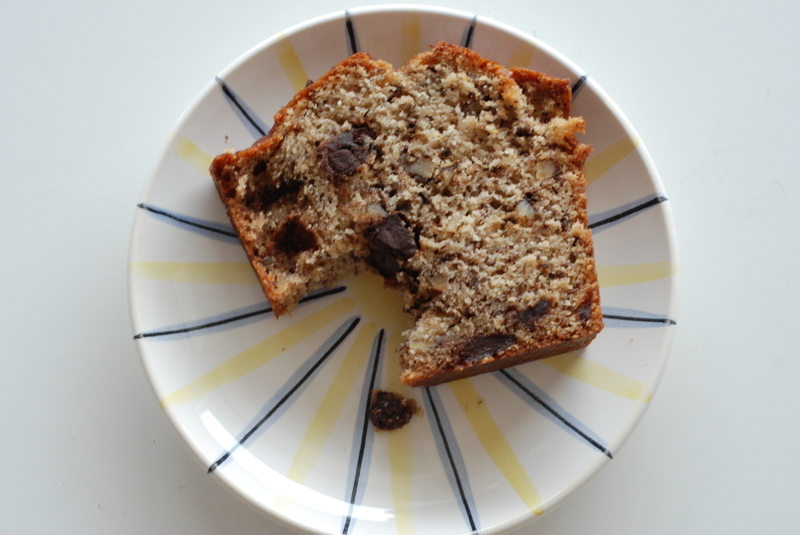 I made a few changes from the original recipe, like eschewing the whole streusel thing Gourmet's version has going for it by incorporating the cinnamon, walnuts and chocolate directly into the batter. Oh, and reducing the sugar a little. Just a little! Yeesh. 1. Preheat oven to 375°F with rack in middle. Butter a loaf pan. 2. Stir together flour, baking soda, cinnamon, and salt. 3. Beat together softened butter (1 stick) and the sugar in a medium bowl with an electric mixer at medium speed until pale and fluffy, then beat in eggs 1 at a time until blended. Beat in bananas, yogurt, and vanilla (mixture will look curdled). 4. With mixer at low speed, add flour mixture and mix until just incorporated. Fold in the chopped nuts and the chocolate. Pour the batter into the cake pan, smoothing the top. 5. Bake until loaf is golden and a wooden pick inserted in center of cake comes out clean, 35 to 40 minutes. Cool loaf in pan on a rack 30 minutes, then turn out onto rack and cool completely.